Once you start getting a bit more ambitious with your car audio, you’ll need a more flexible and capable amp as the centerpiece. If you’ve got 4 speakers in your set-up, a monoblock amp just won’t cut the ice. Whether you’ve got multiple door speakers or you want to bridge the amp to supply a pair of full-rangers and a sub in back, you’ll get incredible versatility from a 4-channel unit. The market is saturated with poor quality amps so navigating this minefield can be tricky. Today, we’ll review 8 of the best 4-channel amps so you can safely invest in an amplifier tailored to your needs and budget. JL Audio is a serious player in the car audio space and the XD400/4 is consistently among the top 4-channel amps on any shortlist. With rugged build quality, outstanding power and minimal distortion, the only surprising part is that it doesn’t cost more. For an affordable alternative to the wincingly expensive Audison, there’s no substitute for JL amp. JL Audio has kept all the controls covered up on the XD400/4 so, while this amp packs some serious features, the aesthetics remain lean and mean. RMS power is 75 watts per channel at 4 ohms, 100 watt at 2 ohms and 150 watts at 8 ohms. Power output is extremely level and offset with a real clarity. Despite this grunt, the amp won’t overheat even under heavy punishment. The JL is nice and compact too so you can slot it more or less anywhere even in a smaller vehicle. The covered controls are ideal if your tastes err to the minimalist. For a big sound in an enticingly small package, you should check out this awesome 4-channel amp at your earliest convenience. Rockford Fosgate strongarms onto the scene in any roundup of the best car audio. You get brand heritage and build quality rolled out in a package that’s surprisingly affordable. The R series is all budget-friendly and we opted for the lower-end R250X4 which offers exceptional value without any dip in performance. With amps at this price point, you can easily end up with a piece of junk that’s fried not long after installation. Although this A/B class 4-channel suffers from overheating to some extent – there’s no cooling fan – this should by no means be considered a deal-breaker. RMS power is 40 watts per channel at 4 ohms, 60 watts at 2 ohms and 125 watts x 2 at 4 ohms when bridged. This is restrained for a 4-channel but still more than fit for purpose. These amps come with a testing certificate. A rarity in the car audio world, the tested wattage actually outflanks the claims figures rather than falling woefully short. You’ll enjoy a wide spread of settings with the Rockford Fosgate so it’s well worth taking your time to tweak things to match your tastes. Heating issues set aside, this is one of the best 4-channel amps on the market. Hifonics offer budget amps with mid-tier performance which is an appealing combo. 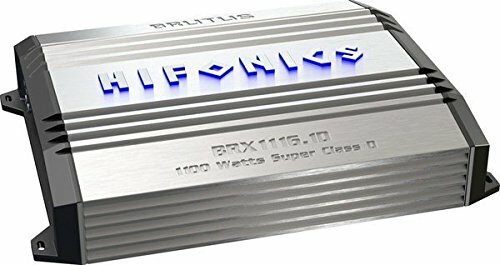 Available in 3 sizes, we went for the largest 4-channel, the BRX1616.4 and the power to price is pretty much unbeatable. If you want to serve multiple speakers or a block of small subs, this amp is the ideal solution. Although the sound quality in your system doesn’t hinge solely on the amp, if this unit kicks out additional noise it will be a menace. The Brutus keeps background distortion to an absolute minimum. Thanks to the aluminum alloy casing, cooling is optimized. Unless you run this amp super-hard, you should get no trouble from overheating. Class A/B amps always win out on the heat dissipation front. RMS power is 400 watts per channel at 2 ohms, 200 watts per channel at 4 ohms and 800 watts bridged. Do not wire them at 1 ohm or they’ll burn out. As long as you consider upgrading your battery, this capable 4-channel BRX amp will reward you with plenty of powerful service. A pricier 4-channel amp from Alpine is up next, the hard-hitting PDX-F6. This class D amplifier packs plenty of power in a compact chassis and runs cooler than you’d expect for this class. If you want to stack them, the heat sinks will cool the whole stack. 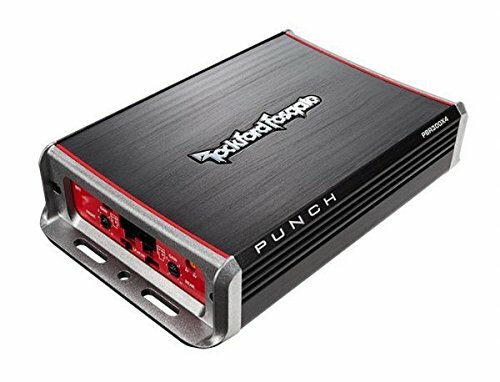 This amp is ideal for any vehicle with limited space. Alpine specializes in top-notch car audio that, while not cheap, still represents excellent value considering what you get for your money. If you have a truck or sports car, space inside is at a premium. For anyone driving a compact vehicle but not prepared to stint on their audio, this slimline, stackable amp is tailor-made. RMS power is 150 watts per channel at 4 ohms or 2 ohms. In bridged mode you’ll get an impressive 300 watts. As well as sheer power, the sound is extremely clean, something that shines through in almost all user reviews. Installation is straightforward even if you’re stacking multiple amps and the overall build quality is first rate. For a rock-solid class D amp in a very small chassis, the Alpine PDX-F6 is right up there with the very best. Boss Audio occupy a steady spot in the car audio market delivering decent gear at a reasonable price point. This 4-channel class A/B is no exception. For efficiency, minimal distortion and a deep and loud sound, the PH4.600 punches above its weight. It’s hardly a budget amp but it will still leave you plenty of wiggle room for speakers or a sub. Boss Audio has really leveled up with the Phantom. Power handling is outstanding with 240 watts per channel at 4 ohms. As well as outright volume, you’ll also enjoy a thudding bass with the ability to drive some serious speakers. Often, if you push the volume hard on an amp, sound quality takes a significant dip. That’s not the case with the Phantom. Even when the dial is jacked right up, there’s a warm and depth to the bass that would be surprising if you didn’t know Boss Audio’s heritage. Build quality is truly impressive. You’ll get gold-plated connections, superb cooling and efficiency across the board. You can hook this amp up in multiple configurations so whether you want to drive several speakers, a subwoofer or a combination, Boss has you covered. Overall, this is one of the strongest 4-channel amps on the mainstream market. Increasingly, consumers are looking for enhanced connectivity with amps. 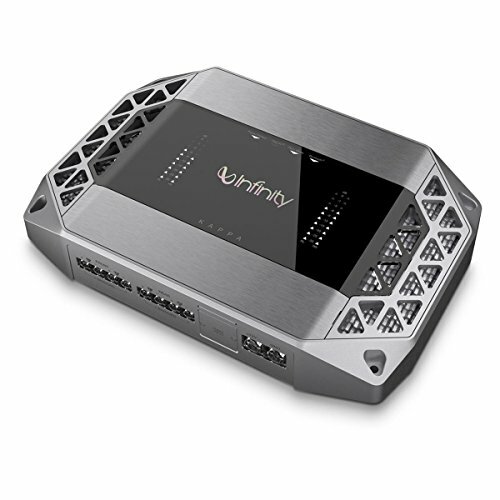 The Infinity Kappa 4-channel is Bluetooth-enabled allowing you to savor a wider selection of music without needing a huge stack of CDs. Coming in a stylish chassis and possessing ample power for a decent pair of speakers, the Infinity Kappa is a smart choice. If you place convenience uppermost, you’ll love the fact you can stream music from any Bluetooth-enabled device to this nifty little 4-channel amp. The best part? Sound quality lost during compression is neatly restored with Clari-Fi technology to further enhance your listening pleasure. You can drive a pair of hefty speakers with 100 watts RMS per channel. Bridged to a couple of subs, you can get 240 watts RMS per channel so you won’t lose out on firepower in the quest for convenience. The wired remote allows you to easily navigate any Bluetooth streaming and you can also take advantage of hands-free calling making this a truly multi-purpose 4-channel amp. Not only does this amp step up to the plate on the sound quality front, it looks lean and stealthy into the bargain. Priced competitively, the Infinity Kappa will not disappoint. 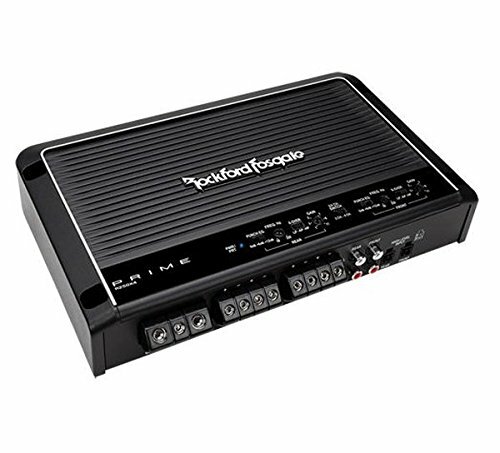 As we near the end of our 4-channel amp reviews, another compact model from the mighty Rockford Fosgate. Whether you’ve got a truck, an ATV or even a motorbike, this dinky little unit packs an extreme Punch just like its name suggests. Coming in at a very keen price point and with enough power for the majority of speakers, this is a 4-channel amp with a difference. 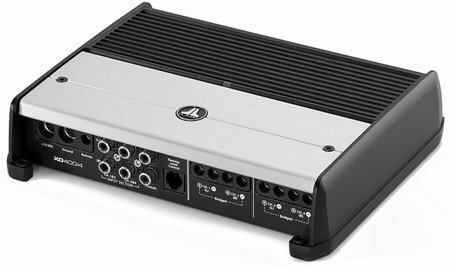 Not everyone is looking for a slab of an amp and for many out there with smaller vehicles, getting a great 4-channel amplifier that fits inside is tough. Rockford Fosgate has addressed this issue head-on and the PBR300X4 is a wolf in sheep’s clothing. If you think an amp this compact will stiff you on the power front, you’d be sorely mistaken. RMS is 75 watts per channel at 4 ohms maxing out at 300 watts. While this might not be enough sound to fill a stadium, it’s more than sufficient for a smaller vehicle. Even if you blast this amp, heat dissipation thanks to the aluminum heat sink keeps the temperature down even as the volume rises. The only real complaints are the fact the Punch is only stable at 4 ohms and it’s not bridgeable. Considering the power to size ratio and the price tag, not to mention the brand you’re buying into, you can’t judge this 4-channel amp too harshly for those small flaws. 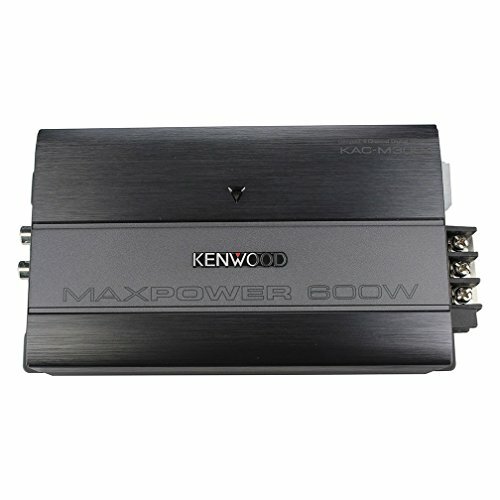 Kenwood has a hard-won reputation for delivering quality at a sensible price point across the full range of car audio. This 4-channel digital amp sticks firmly with that tradition. 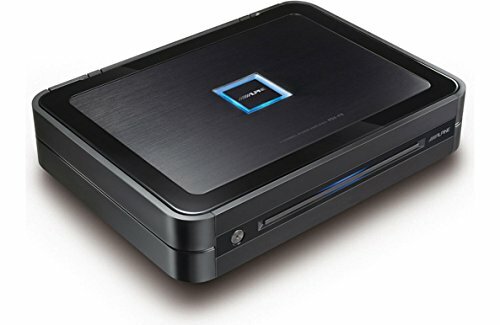 Much like the Rockford Fosgate, this amp is expressly designed to slot into tight spots without eating up too much space. If you’ve got a compact vehicle but you still want substantial sound, the KAC-M3004 is a great audio solution. Smaller amps that don’t stint on power can be tough to find. The Kenwood KAC-M3004 is a scaled-down 4-channel that comes in a sleek chassis with more than enough performance for most reasonable requirements. Through 4 channels, you’ll get 50 watts of RMS power per channel. Bridging delivers 150 watts to each of a pair of subwoofers. Although this is a car audio site, many car fans are also partial to a quick blast in a speedboat. If you want to take this amp out on the water, conformal coating on the circuit board allows you to do that safely. Alongside winning looks, thumping performance and a slimline body, the Kenwood is built to last and it’s an absolute cakewalk when it comes to installation. It’s also priced low so this is a wonderful 4-channel amp even if you’re operating on a tighter budget. We trust you’ve found some suitable 4-channel amps on this list so you can assemble your personalized shortlist and spend your hard-earned money wisely. If you think about exactly what you want from your amplifier and take the time to do plenty of research, you’ll have your speakers and sub fired up and rocking with the best power plant possible. Come back soon and don’t forget to check out our handy guide to buying the best amp for your ride.